The Japanese sensation that’s got a huge following in the West, Hello Kitty is super-cute and perfect for young or ‘Tween girls. 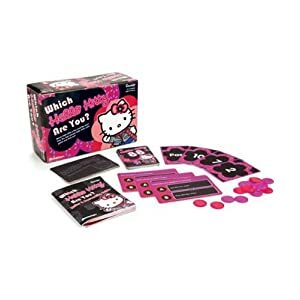 This fun game allows girls to choose their favorite Hello Kitty. It includes random chance elements, skills and even a personality quiz to determine “your” special Kitty match! Little quizzes and friendly questions and dares make this a natural choice, without worrying parents about inappropriate game rules. A great choice for girl parties or sleepovers. If you own the Which Hello Kitty Are You game, please rate it by clicking on the Comments link below the eBay listings.